This Cuban-style picadillo recipe came out of a Fine Cooking magazine. Therefore, I cannot vouch for any sort of authenticity in the ingredients nor do I know if chicken would ever truly be served with picadillo. What I do know is that this is one terrific recipe. 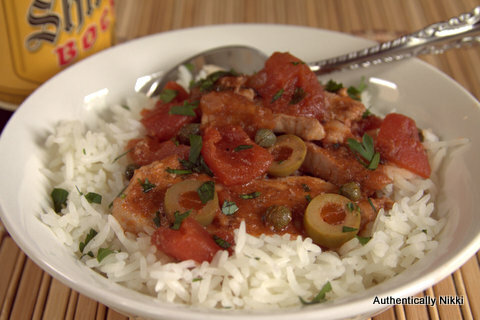 The combination of spices melding together with the tomatoes, the salty olives and capers makes flavorful sauce reminiscent not only of the Caribbean but also of Spain. Don’t let the long list of ingredients scare you off, everything should be a pantry staple, which makes this an ideal recipe for throwing together any night of the week. Trim any visible fat from the chicken and slice each breast at an angle into 3/4-inch thick pieces. Set aside. In a small bowl, combine together the cumin, oregano, cinnamon, cayenne, allspice, nutmeg and garlic. In a 10-inch straight-sided sauté pan, heat 1 tablespoon of olive oil over medium heat until it is shimmery. Add the chicken and sauté until no longer pink, 4-5 minutes. Transfer to a plate. Keep the pan over medium heat and add the remaining 1 tablespoon of olive oil and the onion. Sauté, stirring constantly, until the onion is softened and light brown, 2-3 minutes. Add the spices and cook, stirring constantly, for about 20 seconds. Add the tomato paste, smear it around the pan, stirring for about 30 seconds. Add the wine and stir to loosen the brown bits on the bottom of the pan. Simmer 1-2 minutes until it looks like a coarse, wet paste. Stir in the tomatoes with their juices, the brown sugar and salt. Cover and simmer 5 minutes. Stir in the olives, capers and chicken. Simmer, uncovered, for 5-6 minutes until the sauce is lightly thickened and the chicken is cooked through. Serve over rice and garnish with chopped cilantro or parsley. This entry was posted in Poultry and tagged chicken, Cuban by authenticallynikki. Bookmark the permalink.